The Resident Evil series certainly isn't what it used to be, but Resident Evil 7: Biohazard may soon change that. Shacknews straps on a PlayStation VR headset to check it out at PlayStation Experience. Resident Evil has a reputation as one of the most recognizable survival horror franchises in gaming. It's become practically synonymous with the term. But as the series has aged, it's lost a lot of its edge. Perhaps it was because of mechanical changes, newer characters, weaker monsters, or what have you, but the name "Resident Evil" doesn't quite carry the same weight today as it did in its heyday. The came the announcement of Resident Evil 7: Biohazard, with Capcom aiming to bring the series back to its roots. From the looks of the E3 2016 demo, it looks to be doing just that. This same demo was on display at this year's PlayStation Experience, so Shacknews stopped by to see how the game was coming along. There's one major takeaway to note about the RE7 demo in its current state. It should be noted that this writer is prone to nausea during VR demos, which made the reports of the RE7 VR demo at E3 causing queasiness a major concern. But after strapping on a PlayStation VR headset and playing through the demo in its entirety, it was a pleasure to come away from it without any feelings of dizziness or nausea. It felt like an ideal, albeit brief, experience. The demo, for the unfamiliar, takes an unnamed character through an abandoned shack that feels rotten to the core. Carcasses are strewn about, food's gone rotten, and the wood is falling apart. The goal is to leave, with a locked door appearing to be the way to salvation. Along the way, players will find a video tape that reveals what happened to the last people to step into the house. After seeing their grisly fate and learning how to proceed, the anxiety of foreboding horror begins to set in, particularly as a menacing figure walks across the hall. While this demo wasn't high on jump scare moments, this felt like the big one. To this point, the RE7 demo had been purely about exploration and puzzle-solving. There was no actual combat at any point. While there will be some combat in the main game, it's important to note that Capcom is serious about the survival horror atmosphere for this installment of the series. Players won't step into the shoes of accomplished agents like Chris Redfield, but rather into the far more average shoes of a new character. This character won't be armed to the teeth, harkening back to the old days of scarce resources and learning to escape without killing everything in sight. It's more about surviving through logic and instinct than through sheer firepower. Much like Shacknews' previous playthroughs, this excursion ended with the "bad ending." 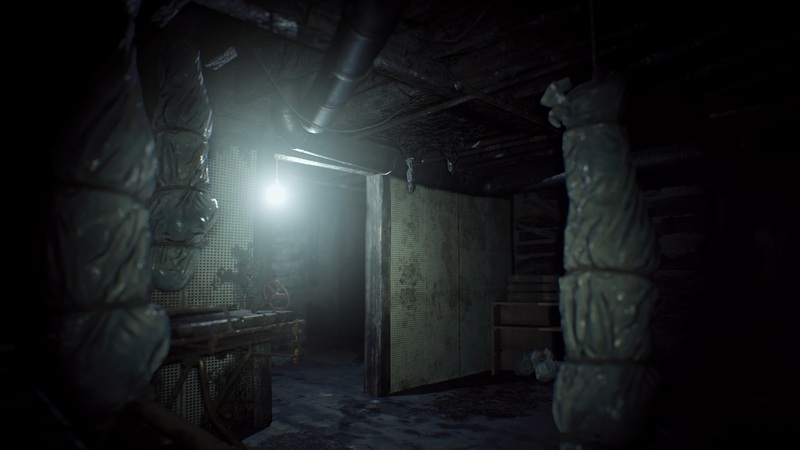 However, for those that have previously tried the Resident Evil 7 Teaser: Beginning Hour demo out for themselves, they'll be happy to know that it has been updated to feature whole new paths and endings on PlayStation 4. Xbox One users are set to get it this Friday, while PC owners can grab it on December 19. Outside of Resident Evil Revelations, the RE series just hasn't felt like the survivor horror pioneer it once was. But there's no denying the promise that Resident Evil 7 shows. Players can find out if it will truly be a return to form when Resident Evil 7: Biohazard releases on January 24. Man, that looks freaky as hell. Graphically it looks very good, I'm curious how what you see in headset compares to what we are seeing in this video. I really need to try out PSVR sometime because I use the Oculus Rift every day... I'm just curious how it compares. Has anything been mentioned about this coming out for PC? It's coming out on the PC, but there's no demo yet. Guys, Ozzie keeps doing it for Shacknews. No on tell him he works for Yahoo! Oh, Whoops! 0unce, you have done it. For. Shack. NEWS!!! Do it again and again.